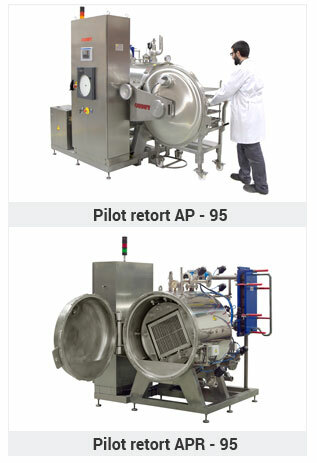 Pilot retorts are used for R&D purposes with new foods and new packs as well as for the improvement of existing recipes or renewed product formulations. Also, our customers use the pilot retorts to produce small quantities for market testing their new launches. Is a model for static processing. It operates with steam and water spray with an option for indirect water heating in the heat exchanger. The saturated steam process mode is also available in the standard unit. The containers are placed in trays inside the vessel. Under demand the stack of trays can be removed onto a trolley for external loading and unloading. Is a multiprocess retort that offers the possibility to operate in static, oscillating or rotary modes with steam and water spray process and optional indirect water heating. Saturated steam and full water immersion processes are also available in the standard execution.